Tagged under Yuki Suetsugu, Madhouse, Series. It's a blessing that something as pleasantly effective as Chihayafuru was released at all in today's anime market. It doesn't do anything complicated. That said, the strengths and weaknesses the author developed during her previous work are still in evidence. It is clear that Chihayafuru is still an open story, the ending suggests that something needs to be done. That isn't it, of course. There's season two yet. But that's no way to end a season. So who should watch a shoujo anime about a team of competitive poetry card playing high school students? To be sure, it has its nuances - it isn't as naive as it first seems, nor are its characters - but in the end its formula is simplicity itself: good characters, an interesting story, and beautiful execution. First 2 episodes have been heartwarming and enjoyable, lets hope it continues. I don't know anything about Karuta but it seems like an interesting game and the anime still makes the game seem extremely interesting despite how simple it is. 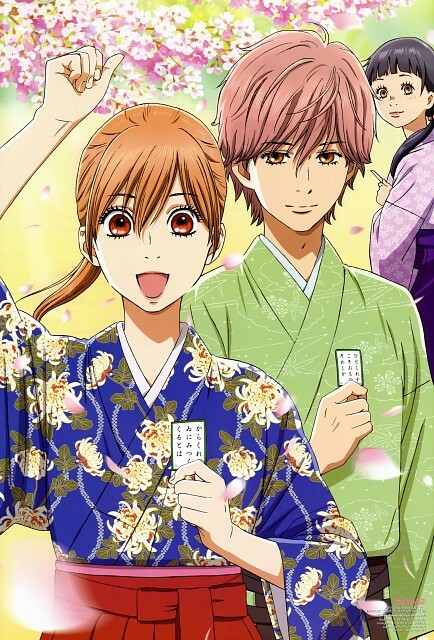 I have seen Chihayafuru, intrigued by the plot, and found it surprising, engaging, one of the best anime I've seen lately, I look forward the second season, the characters in this anime are able to communicate a strength and a passion not common, every episode is so engaging that I found myself cheering at games of karuta... also the quality of animation and character design are really beautiful, for me deserves a nice 9.75... is almost perfect, if in the second season there will be a deepening of the romantic story, for me definitely will deserves 10. I was actually really surprised at how good this series is. I am pretty certain is it a series aimed at girls, but the characters and the story is very well done. The series so far is about a girl who makes it her dream to become the "Queen" of karuta, which is a card game involving 100 poems that have to be memorized. I find myself wanting to see the next episode when I watch this series. I didn't know a thing about Karuta, except that it was a kind of memory game with classic Japanese poems. I was very surprised by the amount of strategy involved in it and by the competitive part of the anime. It's like a sports anime, but with consistent character development, drama, comedy and romance.